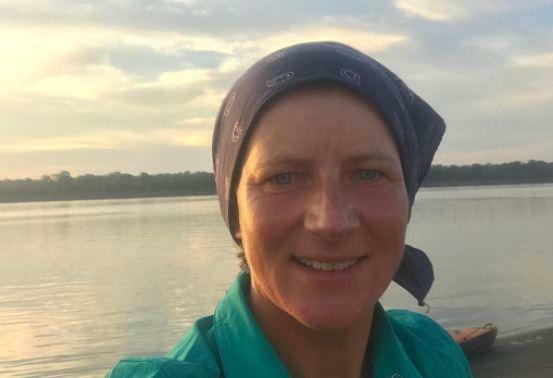 LONDON -- The family of a British woman murdered while attempting to kayak the length of the Amazon on her own have paid tribute to the former school principal. The siblings of Emma Kelty, in a statement released by the U.K. Foreign Office, described the family's pride in their "active and determined sister." The 43-year-old Londoner was last heard from on Sept. 13, after she posted comments on social media sharing her fear of being robbed or murdered in a remote jungle area of northern Brazil that is used by drug traffickers and pirates. Brazil's navy said in a statement issued Saturday that Kelty was between the cities of Codajas and Coari when she activated an emergency beacon. Her kayak and some personal belongings have been recovered. Three people were in custody on Wednesday morning. Kelty, who was logging her "source to sea" adventure on her Twitter account, posted the day before she disappeared that she had encountered dozens of armed men in boats. She was clearly nervous. BBC News quoted the chief of the Amazonas state police as saying robbers tried to sell Kelty's two cell phones, her GoPro camera and a tablet. Kelty was 42 days into her 4,000-mile trip from the Amazon river's source to the Atlantic Ocean when she disappeared. Her brothers Piers and Giles and sister Natasha said in the statement released via the British government that she had "challenged herself, latterly through her adventures on the Pacific Coast Trail, as well as in the South Pole and Amazon River. "We wish to give our immense thanks to the Brazilian navy, police and Foreign Office for their action and support."